We are still loving Hama beads in this house! I only recently found out that you can also buy Mini Hama beads, with a suggested age range of 10 years+. The standard size are the Midi beads, and it's a little harder to find somewhere selling a good selection of the Mini beads. I found the best selection of kits online at Craft Merrily and I bought two packs. I chose a Christmas set because I thought they would make nice Christmas decorations, and a second set with sweet little roses and other flowers. When they arrived I was very surprised with how small the beads were after working so much with the Midi beads - they are about a third of the size, and really, really tiny! Really the only way to manoeuvre them on to the peg board is by using tweezers, and it's very fiddly. More than once I managed to knock the board and send them scattering, and I found out that it is very important to keep them out of reach of fascinated small children! They looked a bit uneven when they were on the board, but once they were ironed (very carefully, and on a cooler setting than normal!) they became a lot smoother. I've started with the Christmas set, and made a lovely little Angel and Father Christmas. I've made one of each and there are plenty of beads left over, definitely enough to make another set. I've just propped them up in the Christmas tree for now, but I might attach some ribbon to them so that they can hang up. I think that I particularly like the mini Hama beads because they resemble cross stitch, which I love to do. but it takes me a long time. It's very satisfying to complete a picture in one go. If you love Hama beads too I'd recommend having a look at the Mini beads, they are a grown up version of a children's craft! 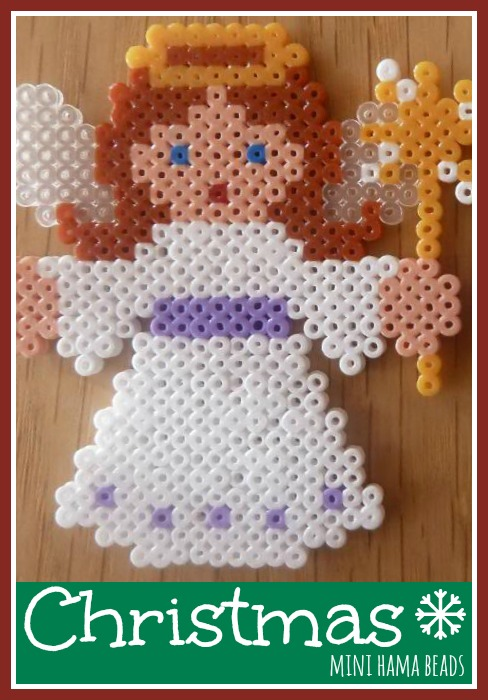 Are you a Hama bead fan? You can find all my Hama bead crafts here!